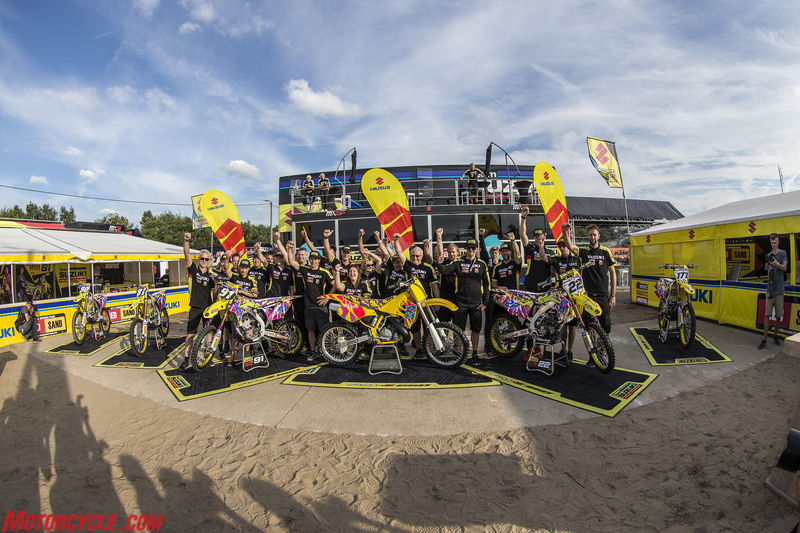 Jeremy Seewer took his RM-Z250 to second place and a ninth MX2 podium result of 2016 while watched by 25,000 spectators today for the Grand Prix of Belgium in the punishing sandy climes of Lommel for what was the 14th round of 18 in the FIM Motocross World Championship. With MX2 points leader Jeffrey Herlings again missing due to injury and Seewer’s closest pursuer in the series standings – Pauls Jonass – also out of action, the Swiss Suzuki star was able to reduce the margin to 87 points and extend his cushion to 107. 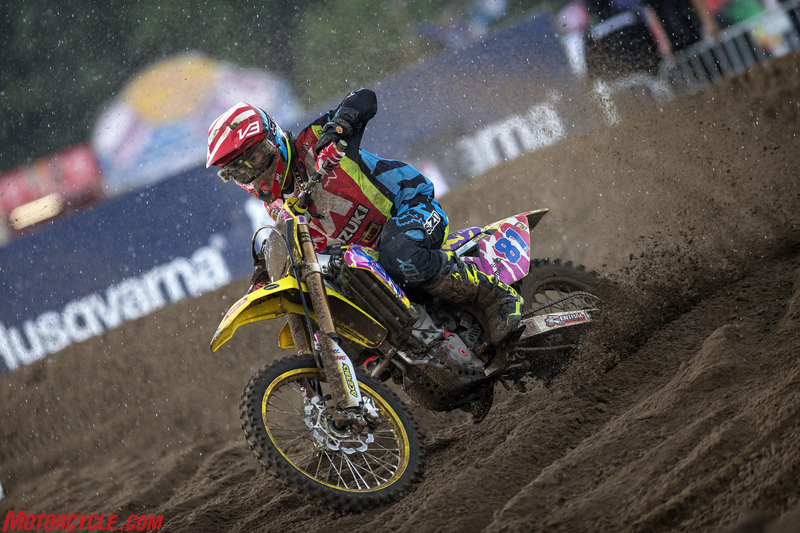 Also on the RM-Z250, Bas Vaessen won his second EMX250 overall of the season and his very first 1-1 double. The weekend started well with Seewer taking profit of Max Anstie’s crash on Saturday to run to his first Grand Prix Pole Position. The ‘#91’ was first into the start gate on Sunday with cloudy skies, bright spells and occasional showers coating the rough and demanding Belgian surface. Seewer made a superb getaway for the first moto of 30-minutes and two-laps duration and was in third place for the first two laps. He eased his pace to conserve energy with a view to a strong attack in the last phases of the race but the MX2 outing was hit by an unexpected heavy shower: The rain reduced visibility and ultimately thwarted Seewer’s plan and he jumped across the line in fourth spot. Under sunshine for the second sprint, Seewer enjoyed the ideal escape. 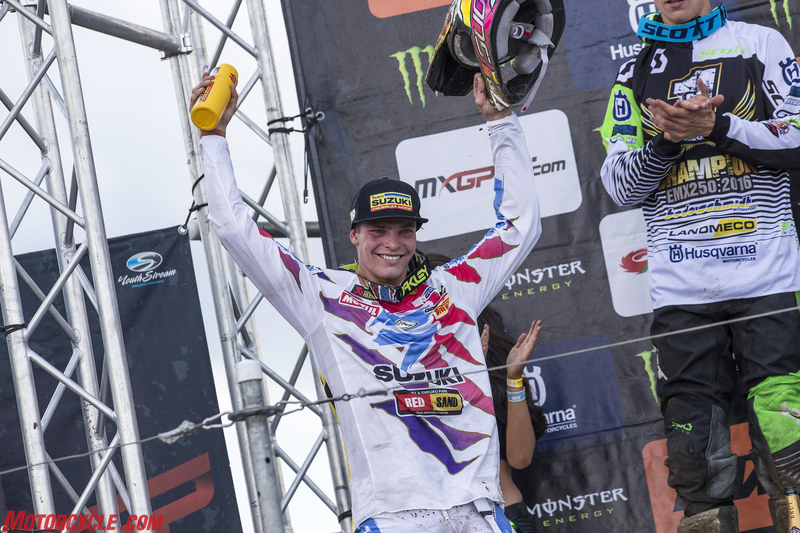 He led the field from the first circulation and drilled the RM-Z hard through the sand to keep adrift of Max Anstie. 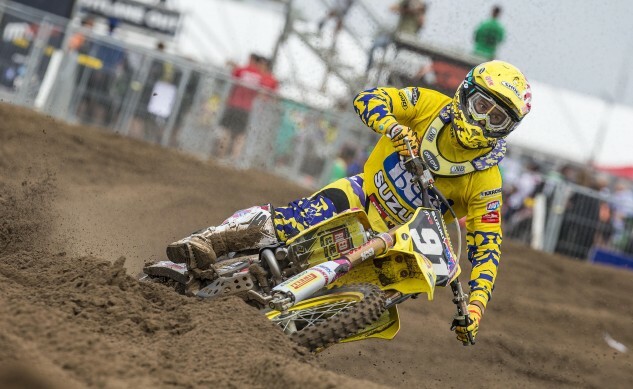 The first moto winner and victor of the Lommel GP in 2014 and 2015 loomed close and although he could front 13 from 17 laps he was unable to resist the Briton to the flag and finished second; earning the same ranking in the overall classification. Brian Hsu set off from 20th in the start gate after suffering from a fork problem in Saturday’s Qualification Heat. On Sunday he started the first moto just inside the top 20 and rode steadily to pick-up several points for 19th position. 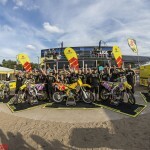 After missing most of the season through injury, Hsu was lacking the edge in terms of endurance and confidence to really attack the Lommel sand. He retired from the second moto. Lommel was home to round nine of 10 in the EMX250 European Championship and Bas Vaessen was back on his RM-Z250 on Euro duty after a solid first appearance in MX2 last week in the Czech Republic. The Dutch youngster – well versed in the demands of the sand – was electric: He diced with title winner Thomas Kjer Olsen and in the first three laps he then set about building an emphatic lead that reached 12 seconds and his second chequered flag (and sixth top-three) of an impressive second term in EMX250. The second moto saw a similar tale up until an untimely slip while challenging Kjer Olsen for the lead. Vaessen had to fight back from third place and a deficit of six seconds with just 13 minutes left on the clock and was soon pressurising the Dane once more. The ‘#98’ made his move with two minutes left to go and notched his very first ‘double’. He is now virtually assured of third position in the championship standings and can still get second place. Frauenfel-Gachnang is a new build circuit and an unknown test for the Grand Prix paddock next weekend. 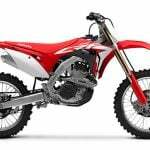 The first round of the FIM Motocross World Championship to take place in Switzerland since 2001 means an emotional and exciting date for Seewer and is the penultimate European fixture on the 2016 slate. MX2 moto1: 1. Max Anstie (GBR, Husqvarna), 36:12.881; 2. Petar Petrov (BUL, Kawasaki), +0:11.777; 3. Benoit Paturel (FRA, Yamaha), +0:15.189; 4. Jeremy Seewer (SUI, Suzuki World MX2), +0:20.081; 5. Brian Bogers (NED, KTM), +0:20.819; 6. Davy Pootjes (NED, KTM), +0:42.291; 7. Calvin Vlaanderen (NED, KTM), +0:46.331; 8. Samuele Bernardini (ITA, TM), +0:52.785; 9. Michele Cervellin (ITA, Honda), +0:54.990; 10. Alvin Östlund (SWE, Yamaha), +1:04.456. 19. 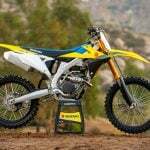 Brian Hsu (GER, Suzuki World MX2), -1 lap(s). MX2 moto2: 1. Max Anstie (GBR, Husqvarna), 35:16.537; 2. Jeremy Seewer (SUI, Suzuki World MX2), +0:09.198; 3. Dylan Ferrandis (FRA, Kawasaki), +0:16.432; 4. Brian Bogers (NED, KTM), +0:17.172; 5. Calvin Vlaanderen (NED, KTM), +0:49.525; 6. Petar Petrov (BUL, Kawasaki), +1:04.026; 7. Benoit Paturel (FRA, Yamaha), +1:06.321; 8. Lars van Berkel (NED, Husqvarna), +1:33.680; 9. Ivo Monticelli (ITA, KTM), +1:36.713; 10. Michele Cervellin (ITA, Honda), +1:40.398. 30. Brian Hsu (GER, Suzuki World MX2), -10 lap(s). MX2 overall result: 1. 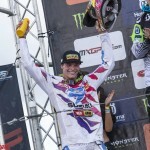 Max Anstie (GBR, HUS), 50 points; 2. Jeremy Seewer (SUI, Suzuki World MX2), 40 p.; 3. Petar Petrov (BUL, KAW), 37 p.; 4. Brian Bogers (NED, KTM), 34 p.; 5. Benoit Paturel (FRA, YAM), 34 p.; 6. Calvin Vlaanderen (NED, KTM), 30 p.; 7. Michele Cervellin (ITA, HON), 23 p.; 8. Lars van Berkel (NED, HUS), 21 p.; 9. Dylan Ferrandis (FRA, KAW), 20 p.; 10. Alvin Östlund (SWE, YAM), 19 p.; 11. 23. Brian Hsu (GER, Suzuki World MX2), 2 p.
MX2 World Championship standings (after 14 of 18 rounds): 1. 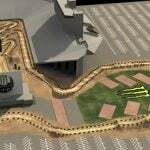 Jeffrey Herlings (NED, KTM), 597 points; 2. 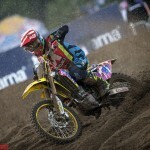 Jeremy Seewer (SUI, Suzuki World MX2), 510 p.; 3. Pauls Jonass (LAT, KTM), 403 p.; 4. Benoit Paturel (FRA, YAM), 393 p.; 5. Dylan Ferrandis (FRA, KAW), 378 p.; 6. Max Anstie (GBR, HUS), 366 p.; 7. Aleksandr Tonkov (RUS, YAM), 320 p.; 8. Petar Petrov (BUL, KAW), 319 p.; 9. Samuele Bernardini (ITA, TM), 294 p.; 10. Brian Bogers (NED, KTM), 280 p. 33. 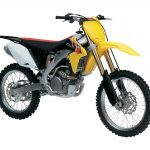 Brian Hsu (GER, Suzuki World MX2), 31 p.
EMX250 Overall result: 1. 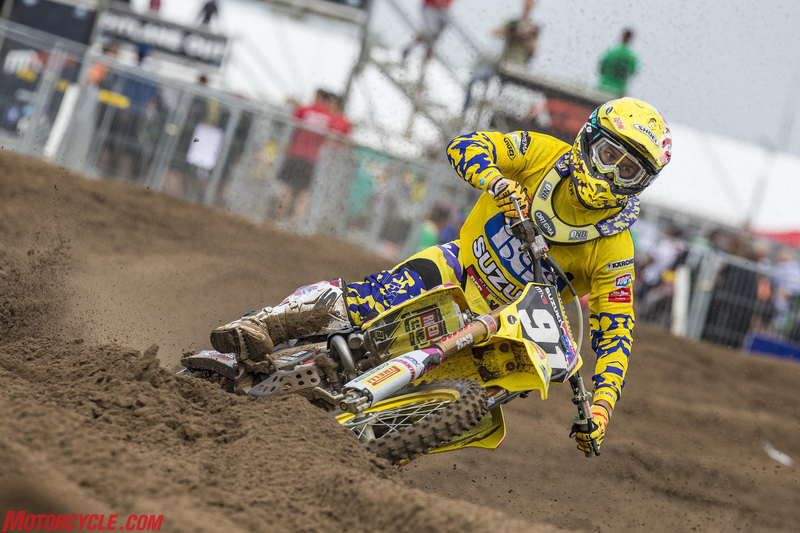 Bas Vaessen (NED, Suzuki World MX2), 50 points; 2. Thomas Kjer Olsen (DEN, HUS), 44 p.; 3. Miro Sihvonen (FIN, KTM), 38 p.; 4. Darian Sanayei (USA, KAW), 38 p.; 5. Kevin Wouts (BEL, KTM), 32 p.; 6. Anton Gole (SWE, HUS), 28 p.; 7. Ken Bengtson (SWE, YAM), 26 p.; 8. Josiah Natzke (NZL, KTM), 26 p.; 9. Erki Kahro (EST, KTM), 23 p.; 10. Maxime Renaux (FRA, YAM), 18 p.
EMX250 Championship standings (after 9 of 10 rounds): 1. Thomas Kjer Olsen (DEN, HUS), 404 points; 2. Darian Sanayei (USA, KAW), 323 p.; 3. Bas Vaessen (NED, Suzuki World MX2), 286 p.; 4. Anton Gole (SWE, HUS), 236 p.; 5. Kevin Wouts (BEL, KTM), 217 p.; 6. Jorge Prado Garcia (ESP, KTM), 210 p.; 7. Miro Sihvonen (FIN, KTM), 201 p.; 8. Nicolas Dercourt (FRA, KTM), 197 p.; 9. Hunter Lawrence (AUS, KAW), 167 p.; 10. Mike Stender (GER, SUZ), 130 p.